I know I've totally neglected this blog of late, but I think I'm ready to get back on track. It still won't be an every week thing, but I HAD to share this deal. This deal starts today and goes through the 23rd! Through August 23, 2009 at Albertsons (as well as ACME, Biggs, Cub, Farm Fresh, Hornbachers, Jewel-Osco, Shaw's, Shop N' Save, and Shoppers- which I've never seen!) 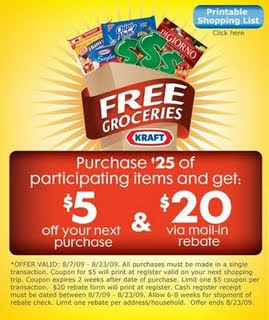 you can purchase $25 worth of Kraft products, use coupons on them, and then get a $5 catalina back which is good off your next purchase. Plus, a $20 rebate form should print when you check out that you can send in for a $20 rebate check. Check here for the products that are included and more details. So without using coupons, you can spend $25 and get $25 back. But if you have any coupons, it can turn into a pretty nice money-maker! It's that time again- Walgreens is offering a free 8x10 print this wednesday, May 6th. You can upload and order the photo here (but you have to wait until wednesday to order!) using the code "MOTHER"
Or you can take your media into a Walgreens store on wednesday to have the photo printed for free with a coupon found in this weeks' weekly ad. Pick up any day but you can only order this on Wednesday. I love when Walgreens does this! I usually do one on my account and one on Russell's and we go in together to pick them up. Hmmm. . . .mother's day gifts? If you know anyone pregnant or if you are yourself- head over to www.uddercovers.com and get yourself a $32 nursing cover for the price of shipping- $7.95. Just go to the website and type in "onefree" when it asks for a promotional code. Seriously you can't make them this nice for this cheap. Hurry because they are running out fast! Good news for those of you who need diapers (sorry for those of you that don't, but diapers are my life!) Walgreens has a program similar to CVS only instead of "Extra Care Bucks" you get "Register Rewards." This week if you buy $25 worth of Kimberly Clark Products (Huggies diapers & wipes, Kotex, Scott or Cottonelle, and Kleenex), you get $10 register rewards. So I'll probably buy 3 packs of diapers for $30 and use 3 (you can print out 2 times every time they reset the coupons so I have 4) of the $5 off Huggies coupons I wrote about in my last post and pay $15 out of pocket. I'll get $10 to buy something else I need in another transaction so it's basically like spending $5 bucks. Hopefully you are using the Caregivers Marketplace that I've written about before to get $.75 back per jumbo pack and then it will be like getting 3 packs of diapers for $2.75 and that's the best STEAL I've EVER seen! If you didn't print out the $5 off or $3 off coupons you still can! Use the coupons.com widget on my left sidebar. Check out coupons.com on my lift side bar for some useful coupons including one for $5 off one Huggies Gentle Care product and another for $3 off one Huggies Gentle Care Product. These are very rare coupons! Use them if you buy diapers and print them now because they'll be gone soon! At CVS this week buy $20 worth of Huggies products (wipes, diapers, bath & body) and get $5 Extra Care Bucks. SO what I intend to do is buy 2 jumbo packs at $10 each and then use 2 $1.50 off coupons (often found inside diaper packs, sent in mail, or in the paper's coupon inserts) to get the 2 packs for $17.00. $5 ECB will print on the bottom of my receipt to use on my next transaction to buy whatever else we need, so it's like getting 2 jumbo packs for $12! CVS also has some deals on shampoo, batteries, and some other things so check out dealseekingmom to find a list of all the deals at CVS this week. GreatClips nationwide is offering haircuts for $6.99, no coupon necessary. I would call ahead just to make sure that the store near you is participating. The Children's Place has their Monster Sale going on right now on their winter clearance stuff. I found some good deals there and shipping is only $5. Use code SA19 and get an extra 15% off at checkout to sweeten the deal. Why the thrill of thrift?